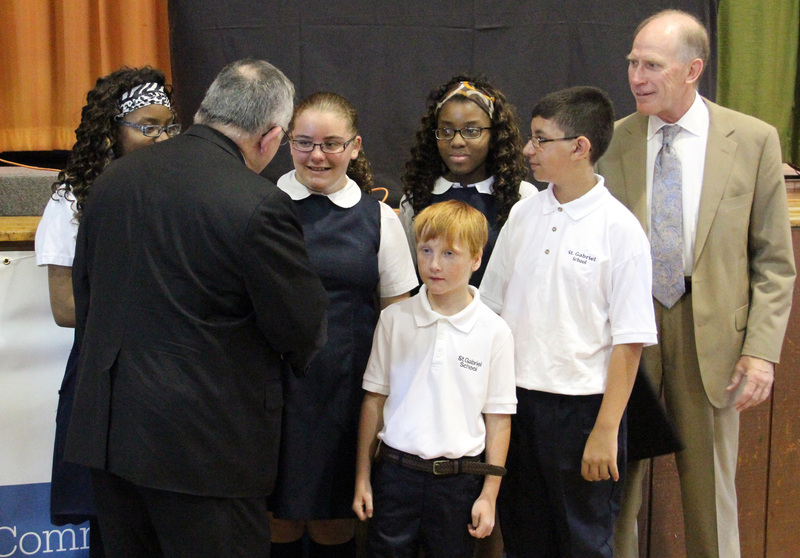 St. Gabriel School in the Gray’s Ferry section of Philadelphia welcomed Archbishop Charles J. Chaput and Brian McElwee, chairman of the Independence Mission Schools (IMS), to officially designate 14 Catholic schools as part of the IMS system on Monday, July 15. Archbishop Chaput signed an agreement transferring control over the schools to IMS. The umbrella organization that oversees the 14 independent Catholic schools represents a new model of sustainable urban education that combines the best attributes of private education with entrepreneurial business management practices and academic accountability. 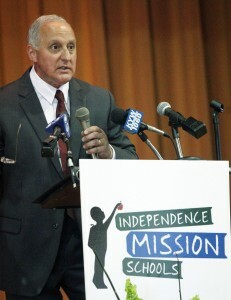 Al Cavelli, president of the Independence Mission Schools, speaks of the goals for the schools in the future. 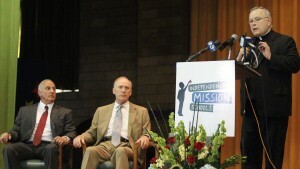 Archbishop Charles Chaput explains the importance of Independence Mission Schools (IMS) in the Philadelphia Archdiocese as IMS’s president Al Cavalli and chairman Brian McElwee listen. 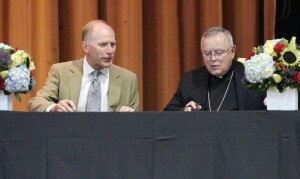 IMS chairman Brian McElwee and Archbishop Charles Chaput sign the agreement between IMS and the Archdiocese of Philadelphia. Archbishop Charles Chaput and Independence Mission Schools chairman Brian McElwee meet students from St. Gabriel School, which is one of the mission schools of IMS. 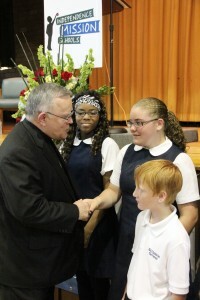 Archbishop Charles Chaput greets Anirah Grew, Caitlin Dwyer and Joseph McCann, who are all students at St. Gabriel School, a mission school. Please consider St Bridget’s School in East Falls, we have a committee that has been trying ti re-open the school since it closed. St Bridget’s Restoration Committee. The school building is in great shape. There are no Catholic Schools in East Falls or Manyunk, and we would really like to have one. I am so excited to be on the ground floor of the Independence Mission Schools. This is re-energizing our wonderful Catholic Schools and giving the children of these schools a better future. 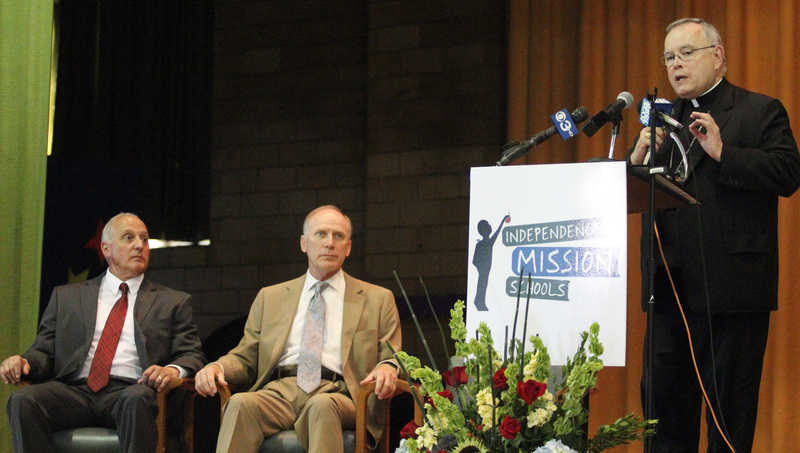 When are the names of the new mission schools going to be announced? God bless Archbishop Chaput and the 14 Independence Mission Schools!! !